As a housewarming gift, Lin gave me this recipe box. But it isn’t just any recipe box, it came with a note that it was filled with recipes to keep my kitchen warm and entertaining for family and friends with great recipes from our coworkers. My fondest work days include the days we had a brownie bake-off (I won and the Teen Librarian took second), a dip-off (Lin won), any birthday party, department holiday party and big game parties. Saying I like food is an under-statement but being able to sample my coworkers creations and then get the recipe? Heaven! I love a community collaborative project because everyone benefits! 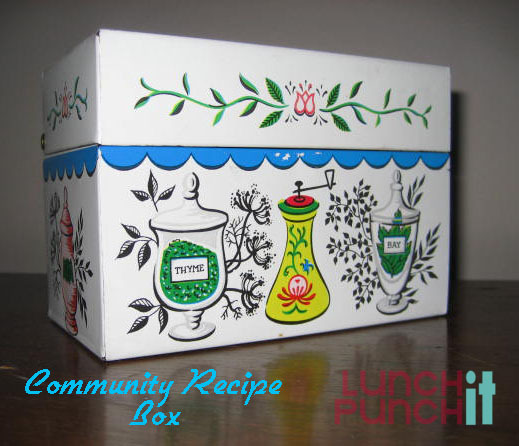 With the spirit of sharing in mind, let’s start a Lunch It Punch It community recipe box. If you post recipes on your blog, leave a comment and I’ll add them to this post.